24 Brunswick Street, Glasgow. G1 1TD. This is one of these pubs that the City Council let fall into disrepair. It has been closed down now for some time just like the Mitre Bar a few doors away, it will soon be demolished probably to make way for some luxurious flats. This old established pub has been here since 1861, proprietor Alexander Davidson stayed here for less than ten years. John Fraser then took over the pub, he was trading as a wholesale and retail wine & spirit merchant and had other premises in Great Eastern Road now the Gallowgate. William Morrison an east end man ran the pub from 1884 to 1888, William also had a pub in Glassford Street. William Reid spent 32 years in the pub he also had premises in Eglinton Street. 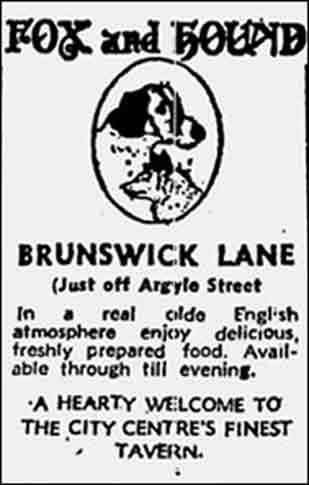 He sold the Brunswick Street pub to well known Glasgow publican James Denholm. Denholm's bar was gutted by fire in 1945 by a lit cigarette left on the premises after closing time. Other names this old pub has been known as is the Angus, William Reid, Denholm's and Fraser's. 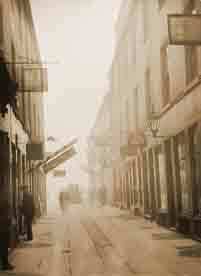 A view of Brunswick Street with Reid's Bar in the background on the right. The Fox and Hound is, traditionally, the name of an English country pub, but I've discovered one of that name right in the middle of Glasgow. This Fox and Hound, at Brunswick Lane, off Trongate, was opened about two weeks ago by Rossi Taverns, who also own the Ingram Bar and lounge in Queen Street. 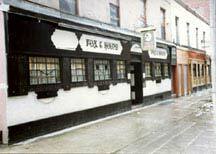 As the name suggest, the Fox and Hound is a traditionally decorated bar lounge, with comfortable surroundings and good service. The manager of the bar lounge is Wallace Blake who has been in the licensed trade for some years. He is delighted with the way the pub has gone since it opened. "We hope to cater for a a cross section of the public over 21 and so that that's who we've been getting," Mr Blake told me. "We've had a mixture of shoppers, office workers, and employees from the bank across the lane." The Fox and Hound does serve food until 7 p.m. included in the menu are some super crusty rolls filled with cold ham, roast beef, or salad. Hot savouries include steak and kidney pie. "We also have specialities like Ploughmans' Lunches and homemade country pie, or an American beefburger which comes complete with garnish, roll, and relish tray and costs only 60p," Mr Blake said. The directors of Rossi Taverns are Mr Alfred Rossi and Mr Peter Rossi. 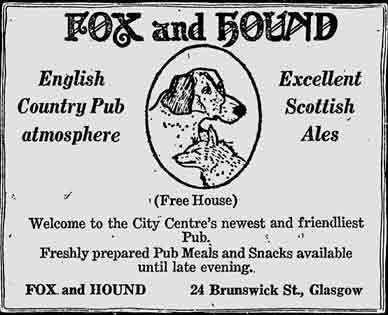 Peter said: "The Fox and Hound is a traditional, even English, kind of bar lounge and it's an idea that we hope to introduce more of to Glasgow. "At the Ingram we have a great crowd of regulars and we want to emulate that elsewhere." The Fox and Hound, which is a free house, is open all day except between 4 and 5 p.m., Monday to Friday. Fox and Hound advert 1979. 1973 Lawrence Crosbie Pollok, for James Sherry.